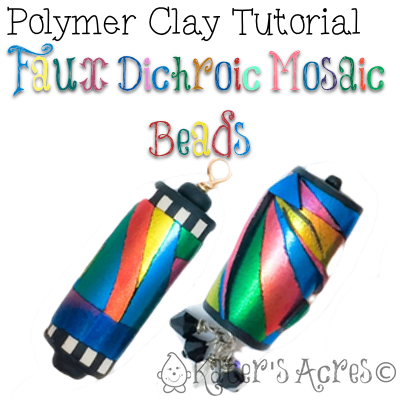 For the month of February, our polymer clay tutorial of the month is Lisa Pavelka’s Faux Dichroic Glass. Please see this post for more information on this free tutorial, including where to get it. Playing with foils is a lot of fun; it’s just one of a few ways that you can imitate dichroic glass. This past year during the 2015 Pavelka Project, members got a chance to make their own items with some fun Lisa Pavelka foils! [Get that tutorial here] In order to complete this project, you will need to purchase some rainbow foils. The hardest part of this tutorial is using the foil. It has been my experience that the foils work best on either Premo! or Pardo clays. Be sure that your clay is soft & fully conditioned for this to work properly. Cut off a portion of your Lisa Pavelka Rainbow foil. I cut approximately a 2″ wide strip, you can use less or more depending on the size beads you would like to make. Fully condition 1/2 block Premo black clay. Please take an extra few minutes to be sure your clay is nice and warm, as well as being fully conditioned. This will help the foils to adhere better. Roll the clay through the 4th largest setting of your pasta machine. Be sure that the clay strip is approximately the same size as your strip of foil. Place your foil with the color side UP. Burnish for approximately 4-5 minutes for the best adhesion. I used a piece of scrap paper to help me burnish my foil. Lift the corner with your blade and quickly RIP the foil off the clay using a horizontal swiping motion. Your foil should be fully adhered to the clay. If not, lay the sheet back onto your clay and burnish the parts of the foil still on the sheet. Use a blade to lift the clay sheet off your work surface (this will give the foil a little texture, which I happen to REALLY like). If you want your foil smooth and uncrackled, do NOT do this step. Cut this strip into triangle, rectangle, and a few strips to make into your mosaic bead. Use scrap clay to make some bases for your beads. Your beads can be any shape or size you desire. I wanted to make barrel beads, so this tutorial will show you how to make barrel beads. I made two barrel beads, both rather “stout” and round. I LOVE big chunky beads for opera length necklaces. Begin at the top of your bead and wrap a slice of your foiled clay around the top. Continue by lining up cut sides of each foiled piece and creating a mosaic-like, tiled pattern. The options for this are endless and oodles of fun, so just relax & enjoy the process. When you get to the end you will have to trim pieces smaller and fit them in. Keep working until the entire base is covered in foiled clay. Once your base bead is covered, you can add anything else you’d like to finish off your bead. I added caps and clay canes to mine. Layered Foils: You can also add some foiled pieces on TOP of the foiled base to add dimension.